Here is your main goal to help the Gumball's mom to make everything ready for the his birthday! There are so many different tasks to do, so hurry up and drive a car like professional. Your best friends are waiting for you! Vanquish this game. 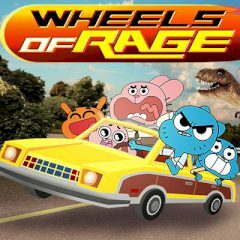 Just put the pedal to the metal as Gumball’s mom and drive in the correct way! It is Gumball’s birthday, and his mom is doing anything to make it the perfect birthday. Drive fast as you pick up Elmore, deliver pizzas, and race for cash! So, if there are no other things to do, then this game is for you! Just use the arrow keys to move and you will cope with it. Read attentively what they have to do and you will be not disappointed. Be sure that you will cope with it. Just try it! Good luck to you!